A celebration of life service was held on 11 December for the late Leando Nibbs who was born on 11 November 1939 and departed this life on 21 November. Mr. Nibbs was born to Vivian Calwood and Ernest Nibbs and was raised by his paternal grandparents in Sea Cows Bay from the tender age of six months. He attended school in Sea Cows Bay and then in Road Town. After leaving school Mr. Nibbs learnt the trade of carpentry and was one of the persons who worked on the Bouganvillea Clinic which was known as the iconic Purple Palace. He migrated to the USVI, but in 1962 returned to the BVI which he missed so much. Upon his return Nibbs opened an auto mechanic and body shop in Huntums Ghut and later branched out into selling automobile parts and ordering vehicles for his customers. On 12 December 1962 Leando married his fiancé Esmie and that union produced two sons –Elvis and Avery. He constructed his family home with his own hands. In 1966 Mr. Nibbs became the Toyota and Hyundai dealer in the BVI – this was a significant and historic moment. He was truly energetic and optimistic as he returned to St Thomas in the early 1970s and opened Nibbs Auto Parts with his brothers in Estate Thomas. The business sold auto parts, cars and included a radiator repair shop. The saying was if you needed a part that you could not find anywhere in St Thomas, go to Nibbs Auto Parts. He lived between St Thomas and Tortola for many years. His business grew over the years. Later he was able to acquire the Napa Auto Parts and the Avis Car Rentals franchises and various automotive dealerships. He was a true business leader and a great pioneer in the car business. Leando was highly respected in both the BVI and USVI where he distinguished himself as a knowledgeable and honest person. In 2005 he was able to complete his lifelong dream of constructing a housing development program called Mountain View Estate in the countryside of Tortola. The Lions International motto “We Serve” was exemplified in the life of Lion Leando Nibbs, MJF, PP, CM, LM. As a Charter member of the Lions Club of Tortola on 27 April 1972 Lion Nibbs first served as “One Year Director” and throughout the years held numerous positions on the Executive Body including that of President. Nibbs found the time and was most active and highly effective in every aspect of Lions projects that meant so much in the lives of many. As time did not always allow his physical presence on a number of projects, Leando was most generous in his financial contributions in support of Lions signature projects including but not limited to: the rebuilding of homes damaged by storms; Lions Primary School Eyes screening projects; Lions Games for persons with special needs; Reading is Fun Week; Construction of restroom facilities at the QEII and Noel Lloyd Parks; The donation of an Ultra Sound Machine and an orthopedic bed to Peebles Hospital and Lions Annual Christmas Basket Delivery. During his earlier years of service, Lions Nibbs was voted Lion of the Year and was honoured with Lions most prestigious award hence designating him as a “Melvin Jones Fellow”. The interment of Leando Nibbs took place at the Road Town Methodist Cemetery: may he rest in eternal peace. 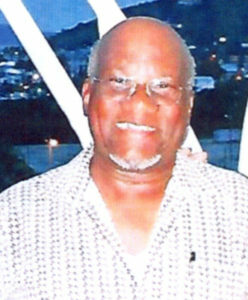 The late Leando Nibbs is survived by his wife – Esmie Thomas-Nibbs; Sons — Elvis, and Avery Nibbs, Children he raised — Angelique White, Angela Allen, and Sinada Fleming; Brothers — Clarence “Clarry” Nibbs, Alphonse Nibbs, and Austin Nibbs, Charles Nibbs, David Hodge, and Henry Hodge; Sisters – Phyllis White, Joycelyn Mercer, Beverley Williams, Lucille James, Julia Maduro, Irene Hodge, and Yvonne Callwood; and many other relatives and friends too numerous to mention. The publishers, management and staff of The Island Sun extend sincere and deep condolences to the bereaved.